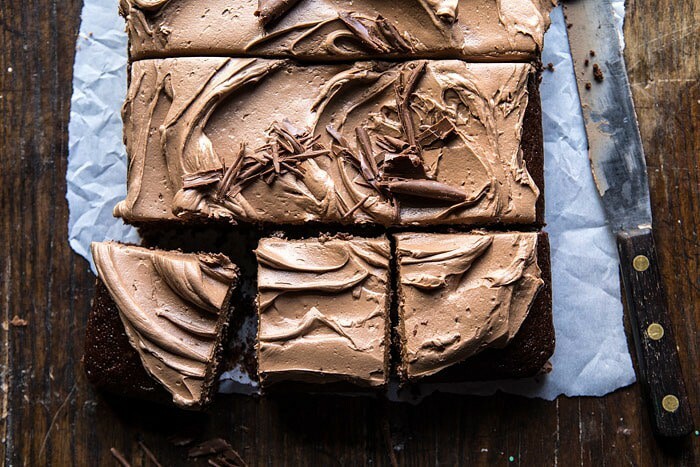 Kicking off the first Friday of February with this easy One Bowl Chocolate Sheet Cake with Milk Chocolate Fudge Frosting. Does anyone else feel like this week just flew bye? I spent the first half of the week traveling to Austin, Texas for a fun shoot with Camille Styles. From there I flew over to LA for a quick taping of Hallmark Home and Family (which aired yesterday, but you can watch the replay here). I flew home Wednesday night, photographed new recipes for HBH on Thursday, and today will be spent filming new videos. Such a jam pack week, but I loved every minute of it. While in LA I was lucky enough to get to hang with my brother Red for a bit too. I wasn’t there very long, but it was awesome to get to see him before he flies to South Korea today with the US Team. I almost never see that kid, so even if it’s just a quick, “hey” it’s still always fun. Red always knows how to get a smile glued to my face and made my quick trip just that much better. The next few days will be spent cramming in all the work I possibly can before heading off to Korea for the Olympics on the seventh. I still can’t believe we are going to Korea, but it’s happening, and I can’t wait! As you can probably guess, I’m also very excited to be sharing this chocolate cake with you guys today, and for a few reasons. One, because everyone knows February is the month of all things chocolatey. Two, because it happens to be my brother Brendan’s birthday, and celebrating with chocolate cake is just something we do. And three, because this cake is beyond good and you all need it in your life sometime soon. I’ve wanted to make a sheet cake for the longest time now, but just hadn’t gotten around to it. For whatever reason layer cakes always excite me a bit more than sheet cakes, but after making this sheet cake, I’m becoming sold on the idea. You guys, if you didn’t know, sheet cakes are the absolute best. They’re easy, no fuss, feed a crowd, and are incredibly delicious. I can already see this cake becoming a regular in my kitchen for birthdays, dinners with friends, and even holidays. It’s so versatile and perfect for so many different occasions. For me, the biggest bonus this cake offers is just how easy it is. As I was writing up the recipe, I realized that everything was made in entirely one bowl, with ingredients I already had in my pantry. 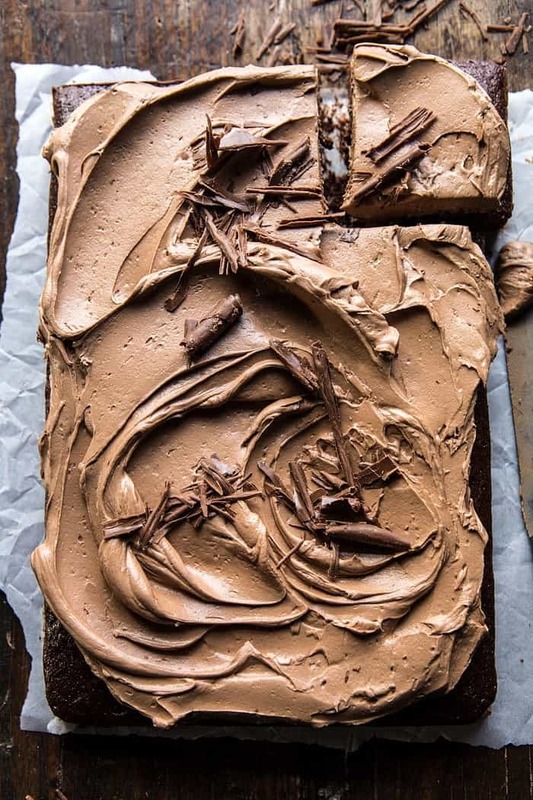 And not only that, there are absolutely zero skills required for frosting this cake. Just spread on a very generous layer of that chocolate butter cream, and done. Not sure about you guys, but that’s a major plus for me when it comes to baking recipes. 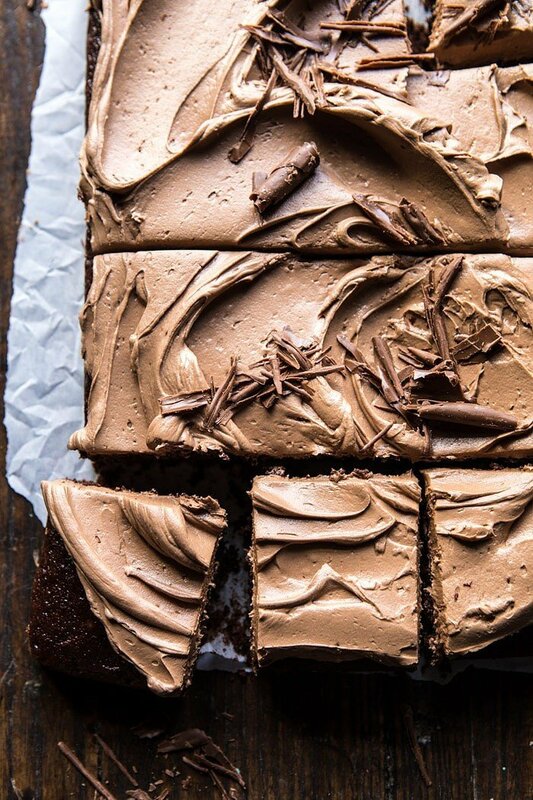 Unlike most sheet cakes, this one is extra moist, chocolatey, and fudgy. My three secret ingredients are buttermilk, Greek yogurt, and coffee. The buttermilk and yogurt keep the cake incredibly light and moist, while the coffee highlights the chocolate flavors going on in the cake. Now before those of you who don’t like coffee click away from this recipe, hear me out. I promise that you do not taste the coffee at all. It’s simply there as an undertone that highlights the flavors of the chocolate. I highly recommend giving it a try before you decide to omit, if you truly hate the flavor of coffee, simply skip it, no big deal. 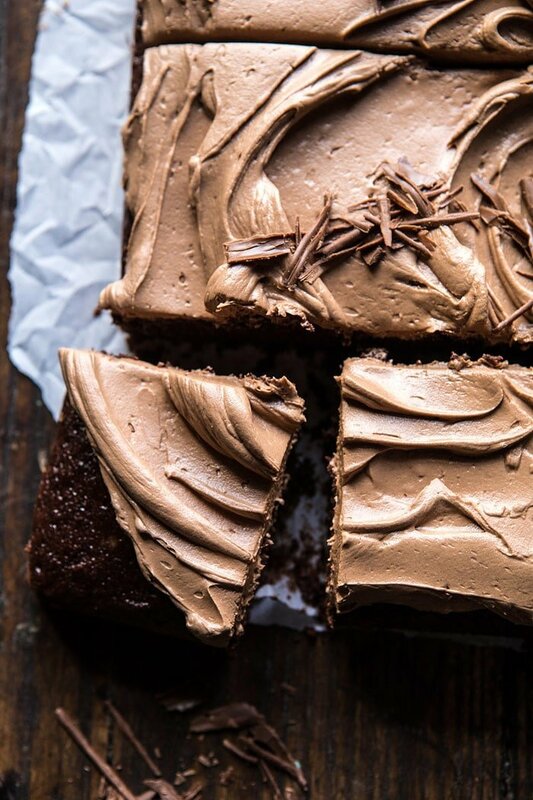 So that’s the cake portion, and while it is my favorite go-to chocolate cake recipe, I think the milk chocolate buttercream steals the show a bit. I mean, it’s really the cake and the buttercream paired together that makes this cake so good, but the buttercream is pretty much just incredible. 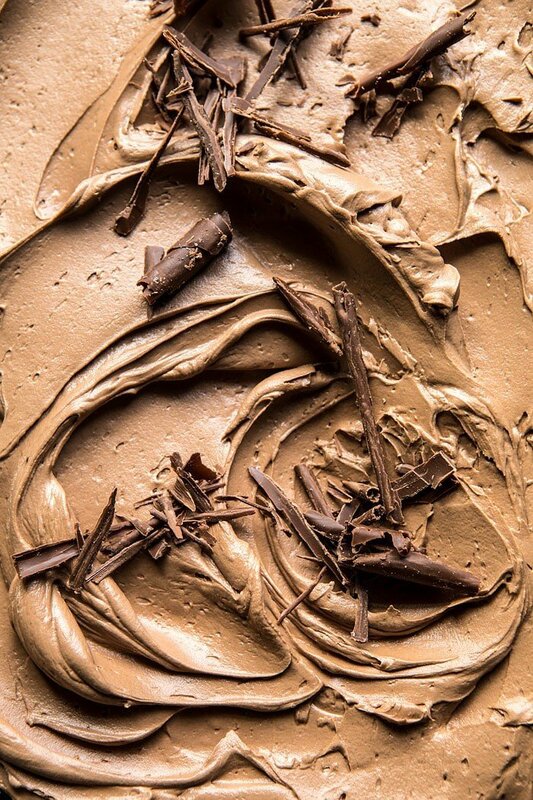 And the key to this buttercream? Whipping in some real milk chocolate. Yes, milk chocolate. I know everyone is all about the dark chocolate these days, and I love it too, but let’s all be honest, some days just call for milk chocolate, and I’m thinking the first Friday in February is just one of those days. I have to mention that not only is this cake great for birthdays, but it would be perfect to make for Valentine’s Day…which semi explains all the roses in my photos. Just a heads up, the roses will be appearing in all my sweet recipes from now until Valentine’s Day. Sorry, I can’t help it. Also, if any of you happen to be hosting a Super Bowl party this Sunday, or even an Olympic viewing party in the coming weeks, this cake would be amazing for that too. As mentioned it feeds a crowd and can also be made ahead time, making the dessert portion of your party a breeze. You can even decorate the cake to support you favorite team. You see, the perfect dessert! Made in one bowl, with ingredients found in your pantry, using zero decorating skills, and the best part...it is so delicious! 1. Preheat the oven to 350 degrees F. Line a 9x13 inch baking dish with parchment paper, then butter/spray with cooking spray. 2. In a large mixing bowl, beat together the eggs, buttermilk, greek yogurt, canola oil, and vanilla until smooth. Add the flour, sugar, unsweetened cocoa powder, baking powder, baking soda, and salt, mix until there are no longer any clumps of flour. Add the hot coffee and mix until combined. Batter should be pourable, but not super thin. Stir in the chocolate chips, if using. 3. Pour the batter into the prepared baking dish, bake 20 to 25 minutes, until the top is just set and no longer wiggly in the center. Remove and let cool completely before frosting. 4. To make the buttercream, add the butter and powdered sugar to the bowl of a stand mixer (or use a hand-held mixer). Beat the butter and powdered sugar together until the butter is light and fluffy, about 4 minutes. Add the melted milk chocolate and vanilla and beat (scraping down the sides as needed) another 2 minutes or until there are no streaks of white. Add 2 tablespoons of the heavy cream and whip the frosting for 2-4 minutes more or until light and fluffy. If desired add the remaining heavy cream and whip until combined. 5. Frost the cake and decorate as desired. PS. see you guys tomorrow for a fun Valentine’s Day gift guide! Valentine’s Surprise Chocolate High Hat Cupcakes. 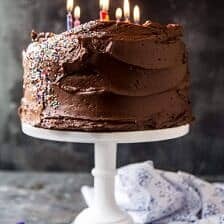 Simple Chocolate Birthday Cake with Whipped Chocolate Buttercream + Video. 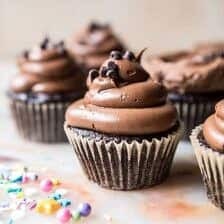 The Best Chocolate Birthday Cupcakes with Fudgy Chocolate Buttercream. Vanilla Birthday Cake with Whipped Chocolate Buttercream. The week definitely flew by; and this is definitely a chocoholic delight’s cake – fabulous! Good luck with all the busyness before flying out. Thank you Liz! I hope you have a great weekend! I want to bake this!!! You totally should!! Thank you Ruth! Tieghan, what do you do to make such a simple cake look so awesome? I visit your blog regularly to be inspired by your photography and this post in particular fascinates me. I would most certainly love a piece, as a chocoholic I will never say no. Thanks for sharing and inspiring! Awh thank you Jenny! This is so sweet! I am really glad you like my recipes and photos! Such a yummy cake. I just feel like grabbing it.I loved the frosting idea used in this recipe. My husband LOVES chocolate! This looks so moist and delicious. I don’t see any roses???? This would be perfect for him!! Thank you Charlotte! hey girl- this looks amazing! Right up my alley! Saw you on Home and Family (so cool) and I subscribed to your blog! Y’all have fun in Korea! Ah that is awesome! So glad you watched! I hope you love some of the recipes on my blog Shawnna! Thank you! Love how moist and sticky this cake looks. Simple elegance is so underrated. Tried to watch the clip, but it doesn’t seem to want to play. Something probably to do with a UK IP address. Hope you have a fab trip to Korea. Good Luck to Red! It looks so yummy and easy. I have printed it out and will be baking this for our Super Bowl treats. Thank you! I hope everyone loved this Brenda! This cake looks wonderful. I love sheet cakes, and took them to my sons sporting event “after” parties all the time. They’d be gone in like 10 minutes; faster if chocolate. This one looks especially good. I might even mix in some Kalua with that hot coffee. Haha that is amazing! I hope you love this one Joyce! Thank you! That icing swirl though! So perfect! My favorite kind of cake Tieghan! Looks fabulous! OMG this looks amazing!! Chocolate cake is one of my very favorite things. I don’t have a big sweet tooth, except when it comes to chocolate cake. Have a wonderful weekend! YES me too! Thank you Natasha! WOW! It doesn’t get any better than this! Looks amazing! 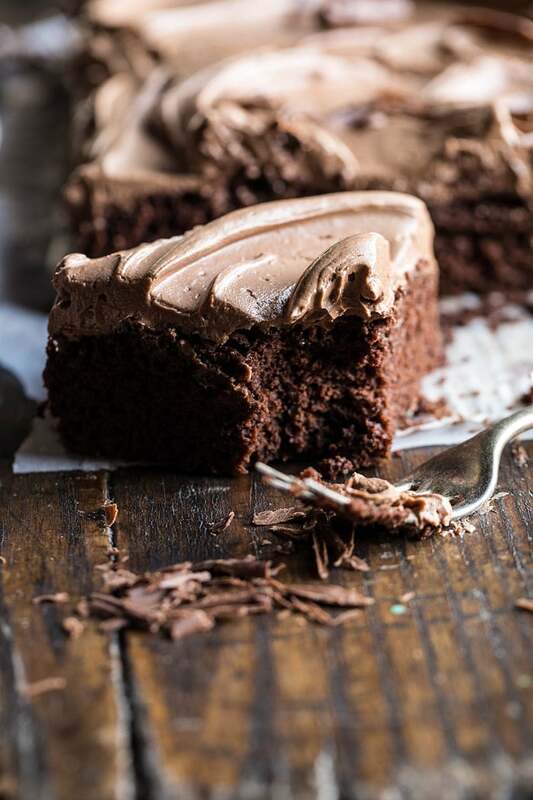 I agree that dark chocolate is my favorite (especially extra dark) but the milk chocolate does seem nice for Valentine’s Day and is a fluffy frosting for the sheet cake. Maybe it would be nice with cocoa nibs on top? That’s nice that you got to spend some time with Red before he leaves and I hope you’re enjoying Brendan’s birthday! Is he joining you in Korea? What all do you have planned? This was amazing! I made it for two friends’ birthdays and it was a big hit. I didn’t let it cool long enough though because of a time crunch but still good. I also tried marbling it with some plain homemade whip cream to cut through the frosting at the end a bit and it worked but I want to try the original again and give it more time to cool. Love you blog and thanks for the recipe! I am so glad you enjoyed this recipe Regan! Thank you so much! I just made this cake because it looked so beautiful, but it didn’t come out right. I followed the instructions exactly however it is not cakey at all. It is very thin and spongy almost like a brownie, but not tasting great. I think maybe more flour could have helped. Only 1 1/2 cups doesn’t seem like much. Any thoughts? Thanks! I will try it again! Oh my goodness this cake sounds fantastic! Love that it’s so simple, too. We are big chocolate lovers. The ingredients sound like it is a super moist cake. Cannot wait to make it! Thanks for your recipe! Thank you Allison! I am so glad you like this! hey tieghan, i made this over the weekend, but the cake didn’t rise at all. it came out of the oven super dense and flat, to the point most of it was tossed. any clues as to what happened? i’m sure it’s not bad baking powder since i’ve used it successfully recently. dead simple, though! 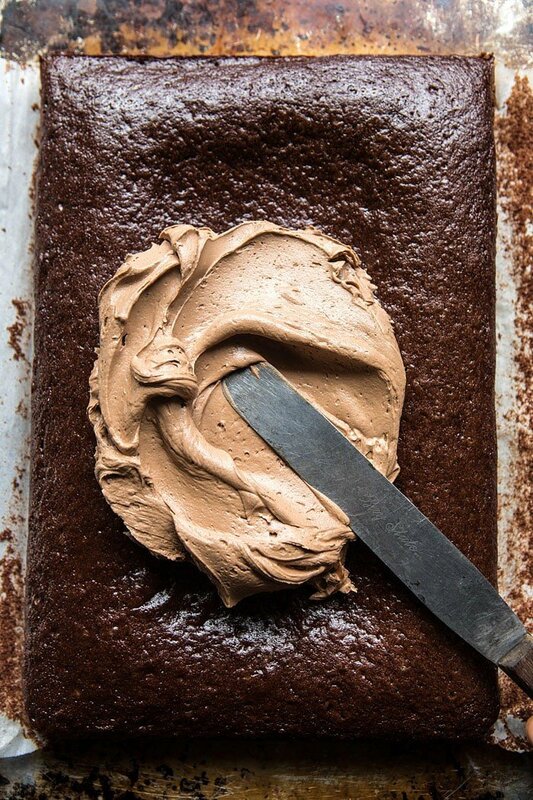 the frosting was great — and i don’t even like milk chocolate or american buttercream, will def be using this again! I made this for the Super Bowl. I had died a layer of toasted marshmallows between cake and frosting. It was soooo good. Sounds amazing! Thank you Nancy, I am so glad you enjoyed this! Cake was more than just a little wiggley after 25 minutes in oven. so i left in for 10 more minutes.and it cracked some on top . I hope it still turned out amazing for you, Karla! This cake looks amazing but id like to make it into a regular round cake – what dimension round tin would you recommend? And would this alter the cooking time? Made this cake tonight before watching the olympics. I belatedly realized that we were enjoying it just as Red won gold in snowboarding! Delicious cake. Thanks for the recipe. That is AMAZING! Thank you Alicia! This is a fantastic recipe! I actually halved it (because I have to save myself from myself when there are sweets in the kitchen). Also, I did not have enough milk chocolate in my cupboard so I supplemented the frosting recipe with nestle semi-sweet chocolate (it was 4 oz milk, 2 oz semi-sweet). I did not add the cream because I prefer a frosting that stays firm. The hot coffee adds a nice dimension to the chocolate flavor. I am so glad you enjoyed this Susan! Thank you so much! Looks lovely. I will have to try and find some conversions from ‘cups’ to grams so that I can try it. Perfect! I hope you love this Fiona! Made this yesterday for Valentine’s Day, and I must say, it was INCREDIBLE! I absolutely HATE the tase and smell of coffee, but I know it adds something to chocolate, so I followed the recipe as is 😉 Any other coffee haters shouldn’t worry a single bit about the amount of coffee in the recipe. I don’t think you even need your disclaimer in the blog post! Secondly, I needed to add 5 or so minutes to the bake time- maybe as a result of different elevation? But it was soft, has stayed moist even though my lid doesn’t have a good seal on my dish, the frosting was easy to mix up, and I will be making this again and again. Thanks for the recipe! I am so happy you loved this cake Vanessa! Thank you so much! Hi this looks great but I do not like coffee. Can I just use hot water instead.? This cake looks amazing, and easy to make! I want to make this for my husband’s upcoming birthday, but I know he hates coffee. Do you notice the coffee taste, or does it more add moisture? And what do you substitute with if you leave it out? I am so glad you enjoyed this Kayla! Thank you!! so this was DA BOMB!!!!! we made it gluten free with Namaste perfect flour blend, and egg free by using greek yougurt, gelatin and a bit of baking powder. I honestly dont think I have ever in my 30+ years of baking had a better chocolate cake and frosting! Awh I am so happy to hear that!! Thank you so much Lea, really glad this turned out amazing for you! I am thinking about making this for an event, how in advance can you make this? Thank you! Just wondering what kind of milk chocolate do you use for the frosting.? Also, is there a substitute that can be used for the buttermilk? Can’t wait to make this for my nieces birthday this weekend! Other than using more of a dark chocolate instead of milk chocolate for the frosting, I followed the recipe exactly. Cake came out very moist with a strong chocolate flavor. I liked the idea of adding chocolate instead of cocoa powder to the frosting. I am so glad you liked this cake Dedric! Thank you! 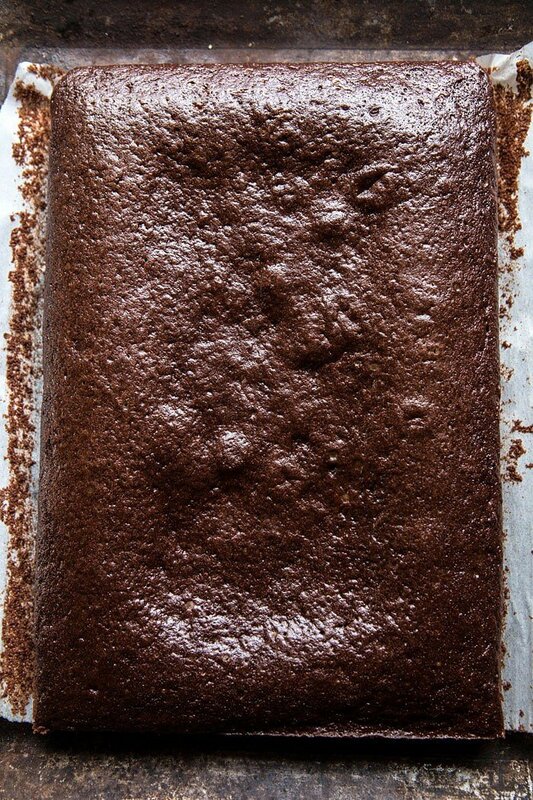 Hi would this work as a single-layer cake using a 9-inch round pan? My oven can only do 1 9-inch round at a time….unless it is okay for half the batter to be sitting in the counter waiting to be cooked? Thanks! Great recipe! 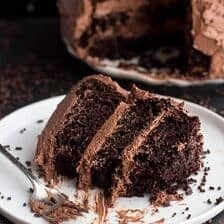 So easy and a deep dark moist chocolate cake . One bite and I knew it was a winner! Woo! Thank you so much Marjie! Just made this and realized was a similar cake to the incredible oreo layer cake with peanut butter buttercream in your cook book. That cake is also awesome! The sheet came out very light and had great volume. We’ll be making this many more times. Thank you! I am so glad you enjoyed this! I made this last week and it’s delicious! Really easy to make, although I think I may have taken it out of the over a little early – it didn’t matter, just made the middle extra gooey. I shall definitely be making this again. Thank you for the recipe. Thank you Leah! I am so glad you loved this! For the most part, my family liked this cake. We won’t add chocolate chips next time as they all, every last one of them, sank to the bottom. All 6 of us, even my 10 year old, thought the frosting was too sweet. I think I’ll add some tangy cream cheese and replace half of the milk chocolate for semisweet. The texture of the cake was nice. Thank you so much for this Vanessa! I hope this turns out amazing for you the next time you make it! 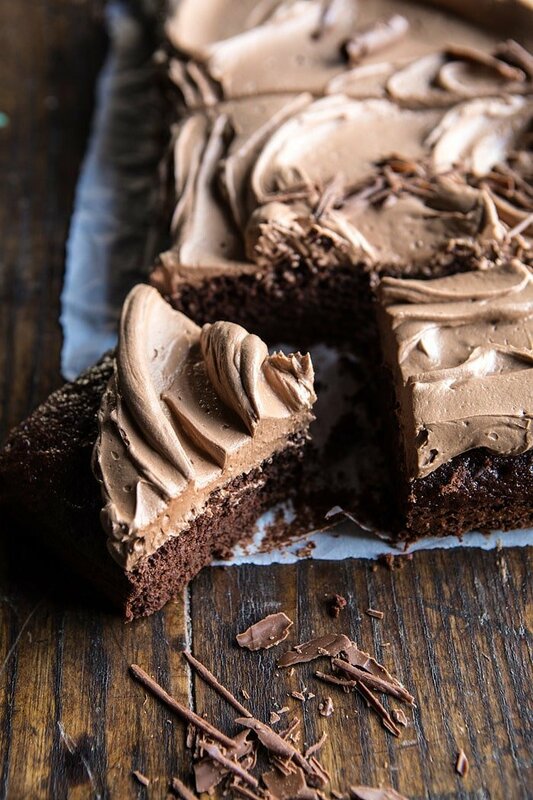 This one-bowl chocolate sheet cake with milk chocolate fudge frosting is absolutely fabulous. I plan to make this tomorrow for a birthday cake, but I’m just wondering something. For the icing, do you mean 8 oz of milk chocolate measured by weight or by capacity? 8 oz (weight) of chocolate is a very large chocolate bar, so I’m just making sure :). I hope she loved this cake Ami! Thank you so much! Thank you so much Alycia! I am so glad you enjoyed this recipe! This cake looks amazing! What would you suggest for ingredient scaling and baking times for a 12×18 pan? Thank you! This cake looks amazing! What would you suggest for ingredient scaling and baking times for a 12×18 pan? Should I perhaps add another 1/2 recipe? Thank you! This cake looks so amazing! What would you recommend ingredient scaling-wise and baking times for a 12×18 pan? Thank you! Hi. Can this recipe be doubled? Do you have any video of this recepie? I tried it out without frosting…the cake rose well but wasn’t too spongy (is it supposed to be like a sponge cake? I can’t get milk chocolate anywhere here..can i use cadburys dairy milk? Great looking cake. Can I substitute Canola oil with Coconut oil (or something else)? I don’t like the taste of Canola oil. I’m going to try this for my daughter’s birthday cake! 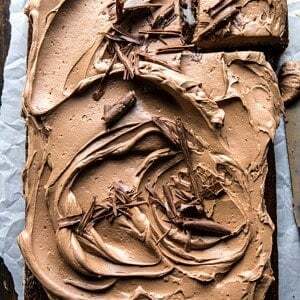 Actually a few years ago I used your recipe for a 3-layer chocolate cake, which I still have, except that I wanted to see if that recipe is suitable for a 9×13 pan (to make a thick sheet cake) – I couldn’t find that same recipe here but found this one! Anyway, if I were to use that triple layer recipe again (which has bigger quantities of each ingredient), would it work for a 9×13 and result in a thicker cake, just maybe a longer time in the oven? Thanks! You’re incredible per usual. 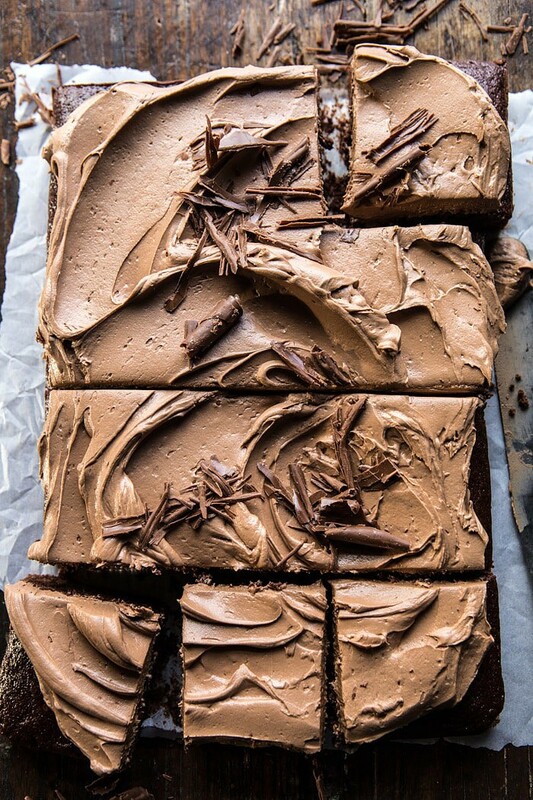 I’m stalking your V-day desserts and decadents for next week and am intimidated by all of them but want to take them on strong and pretend I can! ha. Would this work shaping it as one big ole heart prior to putting icing on it? Basically I’d pay alot of money yet again to have you make this for me and deliver it! Beautiful!!! Just made this chocolate cake, it’s amazing. 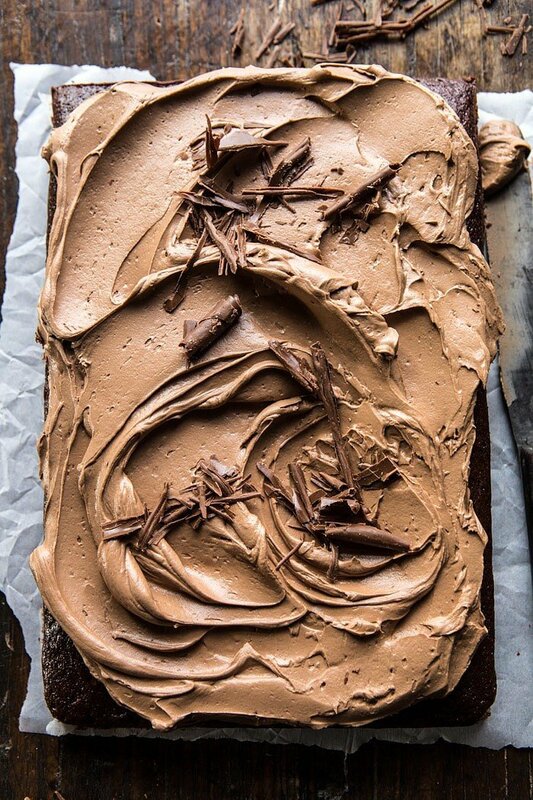 I love the super chocolateyness of the the cake and the sweet, fluffy milk chocolate buttercream, a match made in heaven. Thank you for sharing the recipe and gorgeous photos of the cake. I am so happy to hear that Steph! Thank you!! Have you ever doubled the recepie and layered it? I need a cake for a larger crowd. Want to make sure it would hold up to another layer. I thought this was made using a half sheet pan when I saw the recipe. How can I convert it into half sheet? And what would the baking time be? Double the recipe? Half the baking time? It just looks so good, I really want to convert it! Hey Carrie, I am sorry, I don’t feel comfortable estimating the baking time as I have never tested the cake for the larger size, so I am really unsure of what the time would be. I would thinking doubling the recipe would be just fine, but the baking time I would imagine would be similar or a little longer, again, not sure. Making this right now for my son’s 16th birthday tomorrow! This is his dream cake! Chocolate on chocolate. No frills. No sprinkles. Perfect! I’ve made this recipe twice now and both times it has been a HUGE hit! The second time I made this I made it into cupcakes and added a raspberry on top! So yummy! 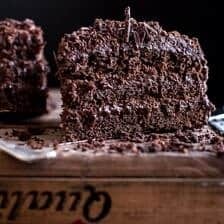 Definitely my new go to cake recipe!